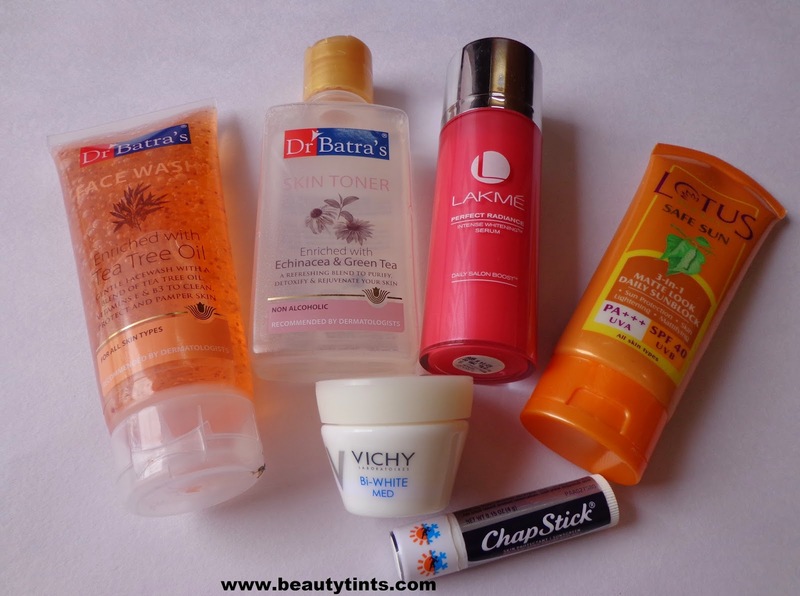 Today I am sharing my current skin care routine.I do follow a skin care regimen which changes according to the climate.As it is a monsoon season now,my skin being a combination one, tends to be on a drier side this season and so I am using the products which gives enough moisturization to my skin.I have reviewed most of these products before.What ever may be the season,Sunscreen is a must for me!!! My skin care regimen involves a CTM (Cleansing,Toning,Moisturization) routine 2 times a day and I use Face masks twice a week and scrub once in every 15 days. 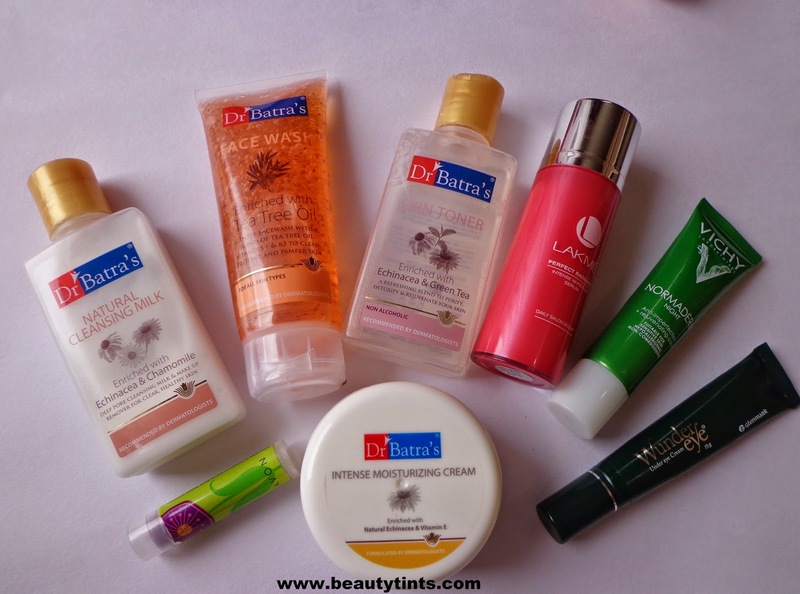 Currently my routine involves mostly Dr.Batra's products which I am loving so much. My morning routine involves a CTM,sunscreen and a Lip balm with SPF. 1) For Cleansing I am using Dr.Batra's Tea Tree Face Wash.
2) For Toning using Dr.Batra's Skin Toner. 3) For Moisturizing I am using Lakme Perfect Radiance serum and Vichy Bi-White Med whitening re- plumping Gel cream. 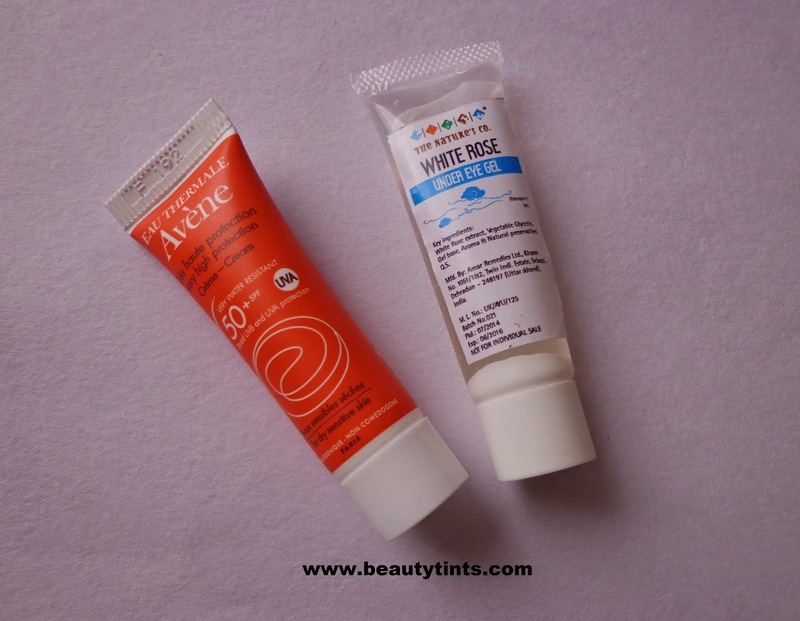 4) Finally I finish with a lotus Sunscreen with SPF 40 ,occasionally Avene Sunscreen with SPF 50 when I have to spend more hours in hot sun and use Chap Stick for lips with SPF 50 +. 5) I do not use any eye cream in the mornings but occasionally I use eye gel like Bio Bloom Under Eye gel and recently I have received White rose Under Eye gel in July Beauty wish box,which I am liking lately. I follow a complete Night Care routine religiously as this is the time,when skin gets enough time to get nourished. 1) For Cleansing I am using Dr.Batra's Cleansing Milk to remove my Makeup, followed by Dr.Batra's Tea tree Face wash.
2)Toning same as morning,for moisturization I use same Lakme Perfect radiance serum but instead of Vichy day cream I use Vichy Normaderm Night Cream. 3)Under eye cream is a must in my Night time routine ,currently I am using Wunder Eye cream. 4)For lips I am using Avon Lip Balm,will review it some time in this week. 5)If I feel my skin needs extra moisturization then I use Dr.Batra's Intense moisturizing cream. 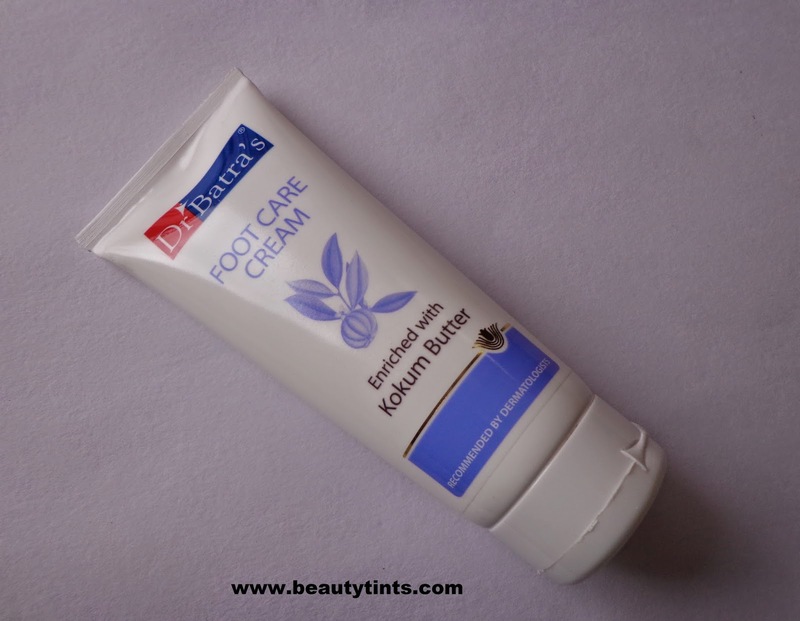 I am using a foot cream regularly these days to maintain my feet with out cracks and currently I am Using Dr.Batra's Foot care Cream,which I will review in a day or two. 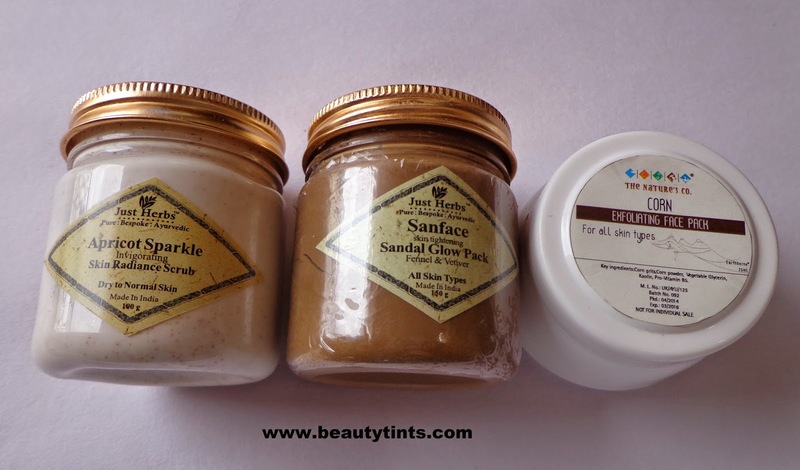 This is my Current Skin care routine for both Day and Night. 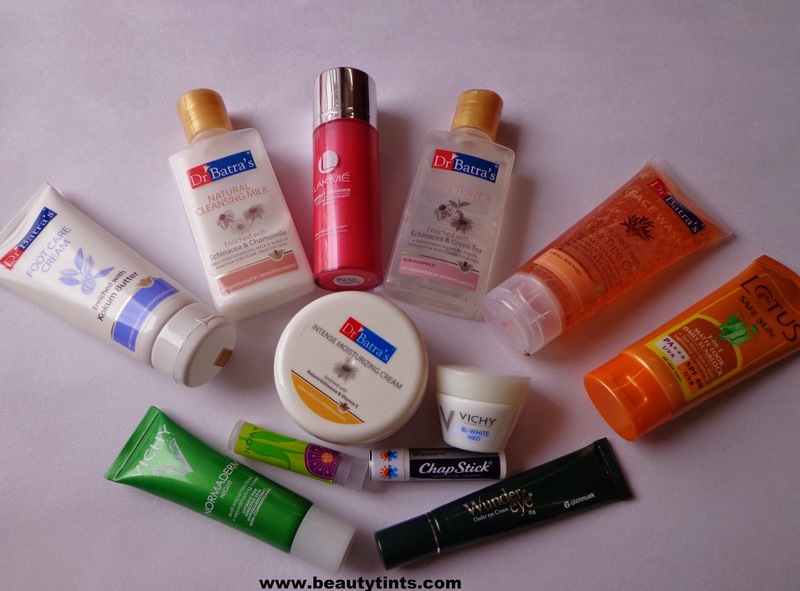 Checkout my June month Empties Post also.